, which is closely connected to the distribution of prime numbers. 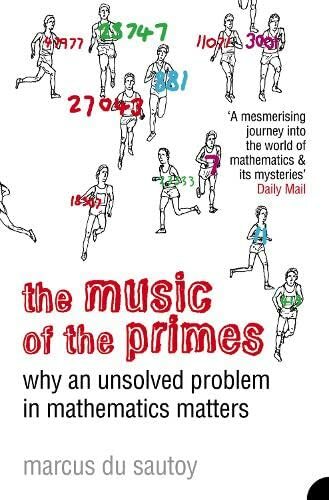 In The music of the primes Marcus du Sautoy charts the history of attempts to prove this hypothesis - the prime numbers tend to fascinate anyone with even the slightest interest in mathematics, so there has been no lack of such attempts. He proceeds via biographical details of those involved, so reading the book doesn't require any prior mathematical knowledge. However, one can tell that it is a professional mathematician writing - he clearly knows the subject he is dealing with inside out. The book takes a short look at the study of prime numbers before Riemann - Euclid's proof that there is an infinity of primes, the work of Fermat, Mersenne and Euler, and in particular Gauss's estimate of how the primes thin out as we go through the integers. These estimates resulted in the prime number conjecture, which is what Riemann was trying to prove when he invented his zeta function. There is one chapter on the Riemann , and one on the origin of the Riemann Hypothesis, which states that all of the non-trivial zeros of the zeta function ζ(s) lie on the critical line Re(s)=½ in the plane of complex numbers. The bulk of the book, however, concerns those who came after Riemann. We find out how Gauss's prime number conjecture eventually became a theorem in the 1890's, proved by Jacques Hadamard and Charles de la Vallée-Poussin, but Riemann's own conjecture resisted attack. When David Hilbert produced his famous list of 23 unsolved mathematical problems in 1900, the Riemann hypothesis was the eighth. A new century brought new lines of attack, such at those of Hardy and Littlewood, and the work of Carl Siegel. The book also has a chapter on Srinivasa Ramanujan. Ramanujan seemed to have a mystical understanding of the primes, and du Sautoy wonders what gems might still be hidden in the many notebooks that he left. Following the second world war, a new generation of mathematicans came along, with people such as Atle Selberg and Paul Erdös working on the Riemann hypothesis. The book examines several other areas of mathematics along the way, such as Gödel's incompleteness theorem, and the use of primes in cryptography, for example the RSA cipher. There is a look at the work of Alan Turing, and how in 1939 he tried to build a mechanical device using cogs and gears to test the hypothesis. Later, of course, he was involved in the development of general purpose electronic computers, and du Sautoy discusses how such computers have been used ever since to evaluate the zeros of the zeta function and so look for a counterexample to the Riemann hypothesis. Tens of billions of zeros have now been found and guess what? - they all lie on the critical line. One of the surprising aspects of the Reimann hypothesis is its connection with quantum chaos. Following a chance conversation between mathematician Hugh Montgomery and mathematical physicist Freeman Dyson, it emerged that there was a link between the positions of the zeros on the critical line and the energy levels of the nuclei of heavy atoms. In the last chapter of the book du Sautoy brings us up to date with the current state of play, and sounds out the opinions of various mathematicians about when it might finally be solved. However it is notable that du Sautoy doesn't deal with the recent controversy concerning a possible proof of the hypothesis - that is the work of Louis de Branges.